Calendar 2018: A joint effort! 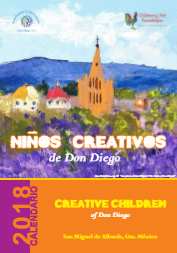 The Children's Art Foundation is working alongside the Fundación Comunitaria Don Diego A.C., a nonprofit association legally incorporated in 2017, created to foster the development of the village of Santa Teresita de Don Diego, in the county of San Miguel de Allende. To support this community foundation, we have launched the new 2018 calendar! This is the largest size ever produced by CAF. At 14x20”; it offers plenty of space to make notes of your appointments and it's perfect for hanging it on your office wall. Featured 12 Artwork created by the Children's Art Foundation winners of the art competition in the past years. This calendar brings a great opportunity to support the children while enjoying their beautiful masterpieces. Children from Teresita de Don Diego community. Proceeds support the Children art program and give the kids a chance to explore their creativity and having fun in self-expression. Donation: $300p or US$17.00 / each. Limited supplies only! Press Conference November 17 at the old Presidential Palace in San Miguel de Allende. In this photograph: Juan Manuel Correa President of the community foundation "Fundación Comunitaria Don Diego A.C." & Hannah McCurley, founder of the Children's Art Foundation A.C.